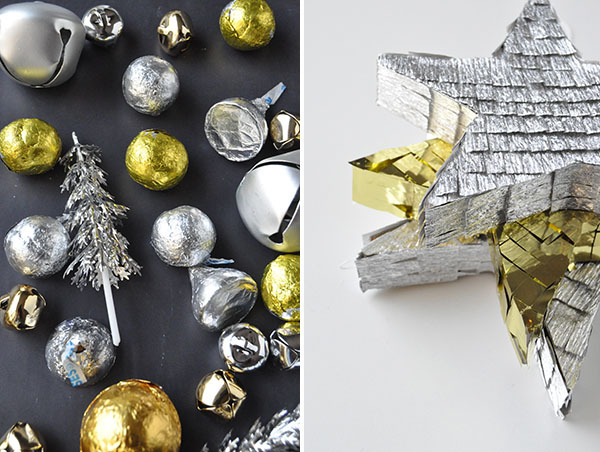 Supplies: Cardboard, silver and gold mylar or crepe paper, scissors , ruler , glue , string , tape , pencil, silver and gold treats. Step 1: Draw a freehand star on the cardboard. Cut out and then trace and cut out an identical star. Cut strips 3/4″ wide. 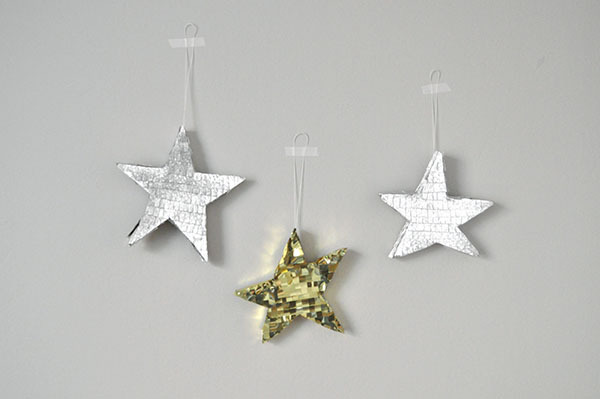 Step 2: Use tape to attach the cardboard strip around one of the stars, folding the strip to fit around the stars points. Step 3: Once the strip reaches where you started, let the strips overlap but instead of securing them together, fold and tape a small loop of string onto the flap. This will allow the piñata to be opened (instead of smashed) to release the treats inside. 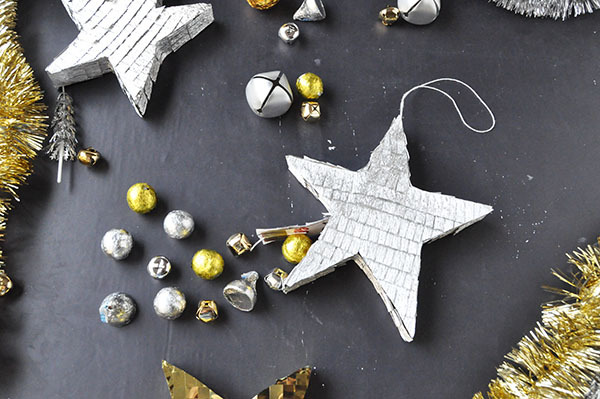 Step 4: Tape on the second star and fill with silver and gold goodies. Use a small piece of tape to keep the flap closed for now. Step 5: Cut your crepe/mylar into fringed strips about 1″ wide. Step 6: Tape a loop of string onto the piñata to be used for hanging. 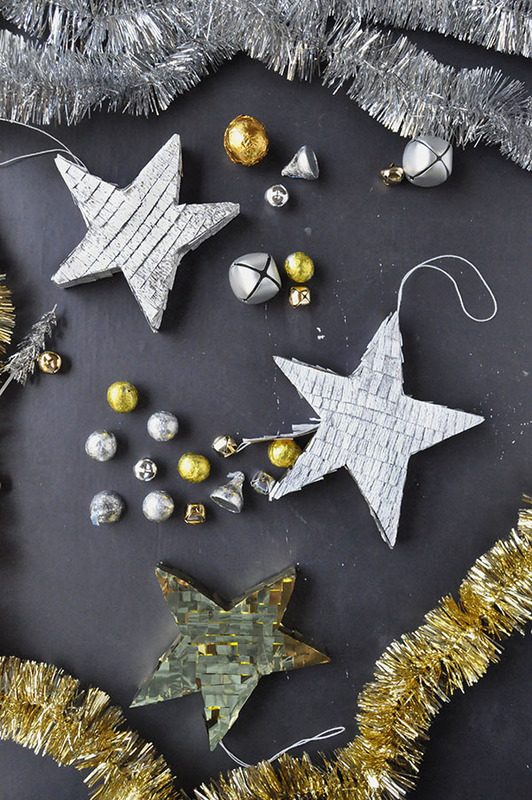 Step 7: Starting from the bottom of the star, use white glue to attach the fringe onto the cardboard. Step 8: Cover both sides of the piñata and let dry for a few minutes. Step 8: Carefully use scissors to cut away the overhanging fringe. Step 9: Glue more fringe around the sides of the star being careful around the trapdoor. Let dry for a few minutes. Step 10: Cut away the excess fringe from the sides. I love these little guys! Definitely would make cute party favors. I forgot to say that I’ve linked your blog as one of my faves on mine! 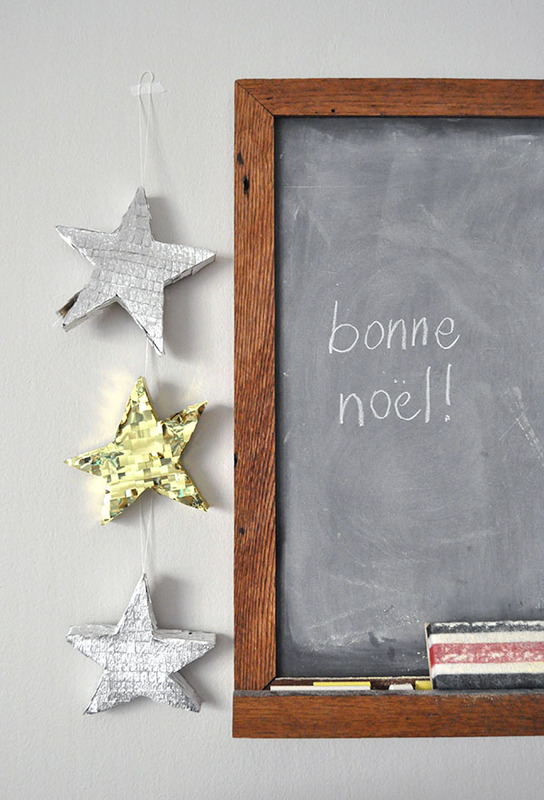 We don’t say “bonne Noël” but “joyeux Noël” or “bonne année” = happy new year ! It’s been too long since I’ve been in French class! Thanks for catching this, Celine! these are so cute! and I love that they don’t need to be destroyed to open up, too! Beautiful! This in on my Christmas decor “to make” list. Hopefully I get around to it all. Thanks for the inspiration! Love it! You bring my on ideas for birthday partys! Hi San Francisco lady artists and Oh Happy Day….. wanted to let you know that we are having our Holiday Party this weekend (female artists of San Francisco). Feel free to join our group and bring friends! I will totally be using your adorable photo booth props! Thanks so much for sharing them for free! Youre the best.